Citroen has just launched their new C4 Picasso and the latest incarnation in a bold tradition is again an innovative MPV. In fact the Xsara Picasso in 1999 was the first and thousands have been sold in Ireland in the interim. 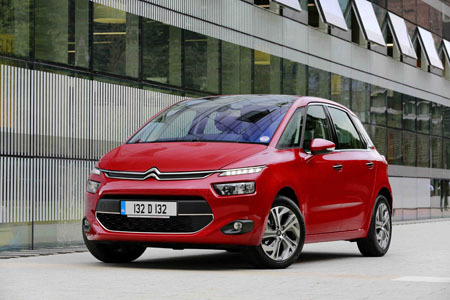 And the latest C4 Picasso is indeed a true expression of Citroën’s Créative Technologie. The new model features a bold and expressive design with dynamic, high-tech styling. It also has a refreshingly uncluttered interior with innovative technologies that impress. Prices start at €24,495 for the HDi 90 manual VTR version. The C4 Picasso is also the first model using PSA Peugeot Citroen’s Efficient Modular Platform 2 platform (EMP2 ), the new-generation C4 Picasso is more compact on the outside, yet offers benchmark interior space and class-leading boot capacity. It also weighs a remarkable 140kg less than its predecessor, which improves agility. It also has improved aerodynamics and a new efficient range of engines including a new Euro 6 compliant BlueHDi powerplant available to order from November production - the New C4 Picasso delivers record CO2 emissions from just 98g/km and fuel economy of as low as 3.8l/100km. This record breaking efficiency has recently been acknowledged with the new C4 Picasso named as the 2013 Best MPV at the Next Green Car Awards in the UK recently. Ar the Irish press launch recently, Citroen told us that it expects new C4 Picasso prospects will come from two main demographics. The first I expected - that is younger families with one or two children. Style is important to these consumers and they do not want to compromise on desirability when looking for a practical family vehicle. The second group took me a bit by surprise - it is older couples with grown-up children. However Citroen made a good case for their research findings in that these buyers value space, practicality, flexibility and ease of access. The sleeker, more dynamic styling is complemented by an assertive front end with new look chevrons and slim LED daytime-running lights set high above new hi-tech headlights. A new enveloping tailgate suggests roominess and strength, and is a dynamic touch to the rear view. The C4 Picasso is available in a range of eight body colours and all versions are fitted with alloy wheels as standard, with a range of original designs from 16 to 17 inches. The C4 Picasso features an uncluttered, loft-style interior ambience with a combined glazed area of up to 5.3sqm. This includes a standard specification panoramic windscreen - unique to the segment - and an optional large glass sunroof that bathes the new C4 Picasso’s cabin in light. The bright and airy interior is also complemented by the quality of the materials used and the attention to detail. The dashboard design combines several colours and materials, including glossy blacks and sparkle-effect finishes. Boot capacity is increased by 40 litres to 537 litres VDA - the best in segment - and expands up to 630-litres with the rear seats pushed forward. The tailgate’s clamshell design means it can be closed even when loads protrude past the open aperture. The front passenger seat also folds flat to create a load floor length of 2.5m. Rear passengers benefit from three individual, full size, adult seats that can be tilted or fore-and-aft adjusted for increased flexibility and comfort. Six clever and convenient storage options include LED illuminated compartments, one of which includes a jack and USB port. On the ETG6 (Efficient Tronic Gearbox six-speed ) versions, there is also a removable console mounted between the driver and front passenger seats. There are storage spaces under the seats and in the doors, and trays with LED lighting are available on the front seat backs. Conveniently located around the car, there are three 12V sockets conveniently located in the front, rear and in the boot. Also available are dark-tinted rear windows, integrated retractable rear side window sun blinds and a rear-facing conversation mirror - a smart touch to make family driving more convenient and enjoyable. Driveability is a key strength of the new C4 Picasso. Whilst maintaining and improving upon the recognised comfort of the model line, the reduced weight and lower centre of gravity - as well as a new modular rear suspension design - establish a new balance between comfort and road holding. New C4 Picasso is the first conventionally powered compact MPV to deliver sub-100g/km CO2 emissions. The e-HDi 90 Airdream engine with the new ETG 6-speed gearbox emits just 98g/km, qualifying for tax band A2. Fuel economy is up to 3.8l/100km - a record in the class. Stop & Start technology is also fitted to most models. New C4 Picasso will be the first Citroën available with a Euro 6 compliant BlueHDi engine, available from November production. The BlueHDi 150 unit will emit as little as 110g/km of CO2, qualifying for tax band A3. This new engine features an SCR (selective catalytic reduction ) module to treat NOX and limit CO2 output. A new six-speed clutchless manual gearbox, the ETG6 (six-speed Efficient Tronic Gearbox ), is offered on e-HDi 90 and e-HDi 115 versions. At the core of the range, the e-HDi 115 engine will emit from 104g/km of CO2 with this new transmission and will deliver as slow as 4.2l/100km combined cycle fuel economy. Safety and wellbeing go hand in hand with the C4 Picasso thanks to a high level of equipment to protect occupants of all ages. In addition a high level of safety equipment on new C4 Picasso has contributed to this strong performance in the Euro NCAP testing including driver and front passenger airbags; front lateral and curtain airbags (including row two ); and Isofix anchor points on all three rear seats for the secure fitment of child seats. As with the outgoing model, the C4 Picasso has been awarded a five-star EuroNCAP rating with an impressive 88 per cent score in the Child Occupant category. Check out the new C4 Picasso if you are in the market for a stylish, compact, and affordable MPV.